Please refer to our stock # uc3 when inquiring. This sensational necklace and earrings will definitely make quite the statement when worn. The necklace is approximately 21" long with an additional 6" chain on reverse, and drapes down 9 3/4" long in front. The matching pierced earrings are 3 1/4" long x 1 3/4" wide and weigh 34.5 grams each. 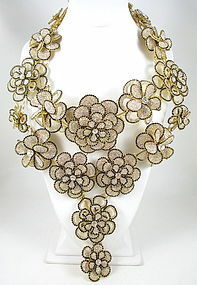 The set has clear pave crystal flowers with black crystal accents and the reverse has a gold tone setting. The set is in excellent condition and is not signed.